How excited would you be if you saw a rare, powerful flash of radio waves from deep space? What if you saw 20 in a single year? 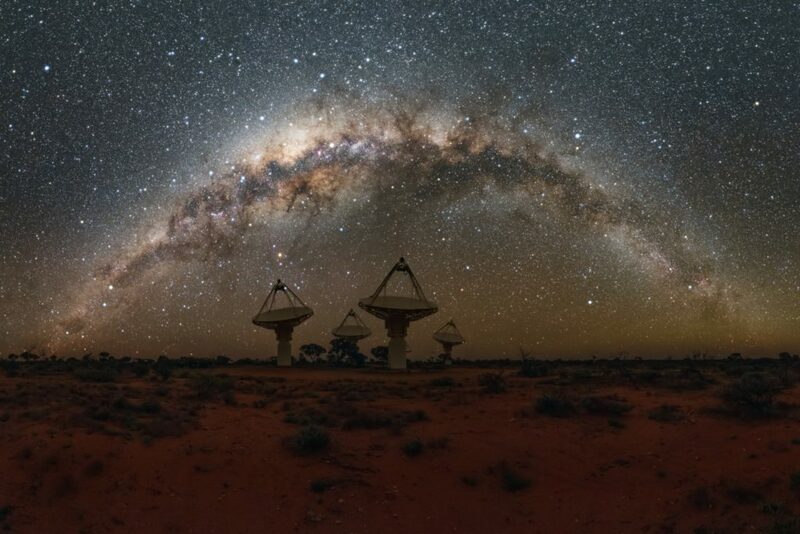 A team of Aussie scientists have done just that using our Australian Square Kilometre Array Pathfinder (ASKAP) radio telescope. These bright and powerful radio waves are known as Fast Radio Bursts (FRB). They’re a mysterious part of astronomy because we don’t know when or where these bursts will happen, what they are or where they come from. This means that scientists don’t get to see them very often. In fact, the first FRB was only detected in 2007 (by our Parkes telescope no less), and since then we’ve only discovered a further 30 (until now that is). 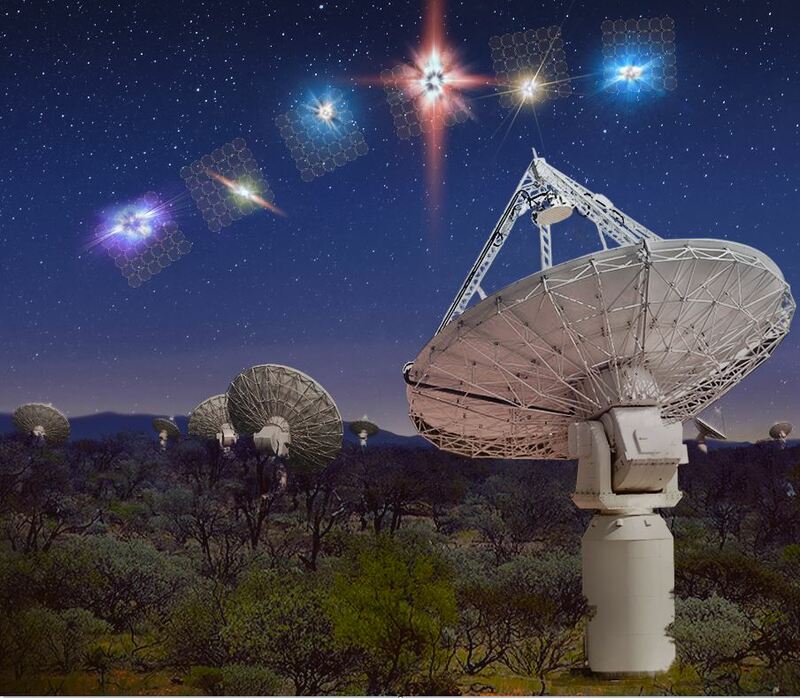 By using ASKAP, scientists from Swinburne University of Technology, OzGrav ARC Centre of Excellence, International Centre for Radio Astronomy Research and our own astronomy team have found 20 FRBs in just 12 months – more than ever before. So if we know that FRBs are bright and powerful (so powerful in fact that the energy in one burst is equivalent to the amount released by the Sun in 80 years), and we can start to see more than ever before, why should we care about them down here on Earth? Well, they’re an essential tool to study other aspects of the Universe (which could help us to answer all of those questions and theories above). Dr Jean-Pierre Macquart, Senior Lecturer at Curtin University and one of the scientists responsible for the discovery knows they’re at the cutting edge of physics. FRBs could also help us to map and weigh the entire Universe – and that’s no small feat. An artist’s impression of our Australian SKA Pathfinder (ASKAP) radio telescope observing ‘fast radio bursts’ in ‘fly’s-eye mode’. Each antenna points in a slightly different direction, giving maximum sky coverage. Image: OzGrav, Swinburne University of Technology. Now, we don’t mean to humble brag (actually, we kind of do, we’re really proud of the work our scientists do), but ASKAP isn’t even fully operational yet. In fact, the team were able to detect the 20 new FRB’s with only eight antennas up and running. By the beginning of next year we’ll have all 36 antennas pointing to the sky, helping us to uncover some of the greatest mysteries of the Universe. *Just kidding, we already know the answer is 42.